Imperial Royal Guard are bodyguards to the most important figures in the empire, they are melee power houses, and ready to jump in front of any threat to ensure the success of the mission. 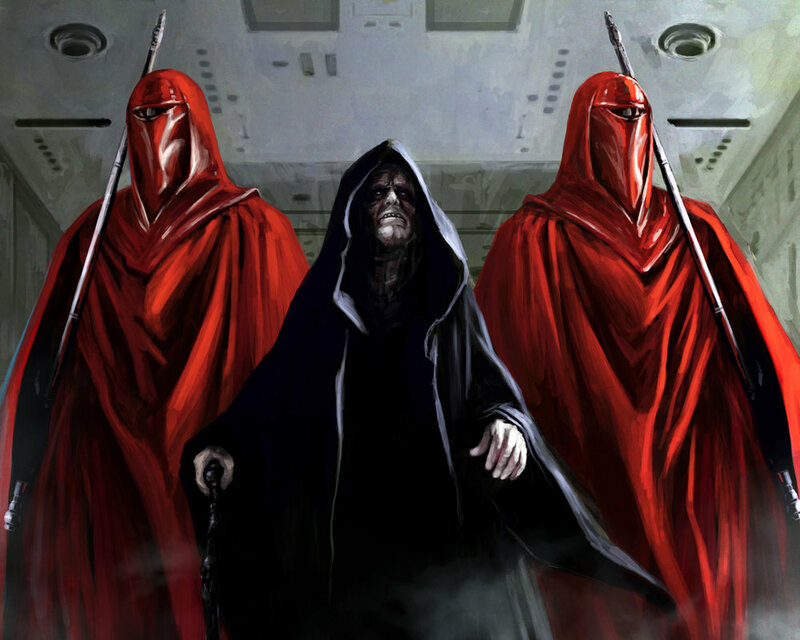 In Star Wars: Legion the Royal Guard are an Imperial elite unit option. They are fast, sturdy, and efficient in melee - and as such see specialized use in of Imperial forces. Royal Guard are a melee centric warriors, but but bring some ranged options too. They are the shield and tarpit of your list intercepting enemy units before they can do much harm. Their primary job is to engage the oncoming enemy units in melee and defend your general as they progress towards completing the mission objective. The base unit of Imperial Royal Guard are slightly below average in melee output which seems odd given that most people would consider them an offensive melee unit, but take into account their above average in attrition value and Guardian 2 keyword and it becomes clear that they are a tar pit unit designed to protect and defend, not primarily an offensive unit. Their low damage output and survivability are mitigated and compounded though when you take into account that most units they engage will probably not be melee centric and thus not equipped to reduce the amount of damage the Royal Guards deliver in melee, nor able to deal enough damage in melee to slow down the Royal Guards. Their high courage value combined with their Discipline 2 ability ensures that the Royal Guards will almost always be taking 2 actions every turn - and their Charge ability doubles down on their action efficiency when they are intercepting opposing units in melee, allowing them to double move and make a melee attack. Their Guardian 2 keyword is one of the main reasons to take the Royal Guard, they ensure that your general or key units are safe and free from harassment to do their work. It is hard to put a value on letting your key units do their job free from worry, but the Royal Guards are definitely worth their cost in this role. Electrostaff Guard: This upgrade adds a fourth figure to the unit increasing their health from 6 to 8 and their ranged damage from 3 to 4 - interestingly though it only increases the Royal Guards melee damage from 3.75 to 4.75 making them less efficient in melee. The main point of this upgrade beyond the health increase is that it gives the unit Immune: Pierce against melee attacks meaning that they can go toe to toe with a lightsaber wielder or similar without worry. With this upgrade the Royal Guard out melee Luke Skywalker (but not quite Darth Vader) for a fraction of the points and can engage him in melee without worry. The Royal Guard have two Training upgrade slots, a Gear slot, a Grenade slot, and a Specialist upgrade slot. The Royal Guard begin at 75 points making them relatively expensive, but not inefficient. Allowing you room to give them upgrades to better suit their role in your list. In general though it is best to keep the unit under 120 points to maintain efficiency. The first consideration when upgrading your Royal Guard is whether or not you want to take the Electrostaff Guard. Generally it is a good idea if your primary use is the Guardian 2 on the Royal Guard for the increased longevity from the extra health is integral to how you use them. Also when you expect to encounter lightsaber wielders or are not sure what you might encounter. The second place to look at upgrades on the Royal Guard is in their Training upgrades. The two to look at are Tenacity which works really well on them when combined with their Guardian 2 keyword ensuring that they will almost always get their extra Tenacity die - increasing their expected damage output in melee by 0.75. If you have taken the Electrostaff Guard and Tenacity your total cost is now 104 and your melee damage output (after taking 1 wound) is 5.5 increasing their efficiency as well as their attrition value. Combining this with Hunter will also give them an aim token when engaging a wounded character or unit greatly increasing both their damage output and their action economy. Their Gear slot contains some useful upgrades you can take if you have the points to spare, but are by no means essential. Mainly the Emergency Stims upgrade which combos nicely with their Guardian 2 keyword as well as Tenacity ensuring that they stick around to defend your key unit and deal the most damage they can on their initial charge. The Recon Intel is also a useful upgrade on them getting them out into position and closer to the action quicker. The Grenade slot is a bit unnecessary on the Royal Guard as they will want to engage units in melee as soon as possible. The tactics for the Royal Guard at their simplest form are quite basic: keep them near an important unit and then rush into melee as soon as something gets close. However the subtleties and timing can take some practice and can change slightly whether the unit they are guarding is being used offensively or defensively. When playing the Guards and their ward offensively it is best to keep the Royal Guard ahead of their ward but still within range 1 so that they can charge forward to intercept any hostile units but also be within range for Guardian while on the approach. Because the Royal Guard are a 3 or 4 man unit when engaging in melee it is a good idea to position them so that another unit can join the fight - enabling you to get another unit into melee if necessary. When playing the Guards defensively keep in mind that the Guardian keyword only needs line of sight to the unit you are guarding, you don’t need line of sight to the attacker. So it can often be a good idea to position the Guardian or the ward in a way that they can’t both be attacked by enemy forces, especially when defending an objective. It is also important with the Royal Guard to remember that you don’t get suppression when using the Guardian keyword, only the initial target of the attack gets the suppression. The Royal Guard are also quite synergistic when combined with either of the force wielding commanders of the Empire, which is very thematic. Not only to both commanders really want the Guardian 2 ability the Royal Guard bring, but they also both greatly enhance the Royal Guards threat and efficiency. When guarding the Emperor, the Royal Guards can often rush forward to engage a unit that is threatening him getting their charge attack and then Palpatine can use Pulling the Strings to give them a second attack dealing 11 damage in a round which should be enough to eliminate most average threats - including Luke - but possibly not another Royal Guard unit or Vader. Keep this combo in mind when playing the two together and also that you can do the same combo in reverse order to give the Royal Guard essentially 3 speed 2 moves. Similarly when accompanying Darth Vader, his command card New Ways to Motivate them can give them a wound activating Tenacity as well as allowing them to make 3 speed 2 moves into a charge melee attack. threatening an incredible area of the board and dealing quite a bit of damage. Unfortunately this leave Vader outside of the Guardian 2 range, but Vader won’t need to fear from much after the Royal Guard crush their enemies. This combo plays especially well when you bring 2 units of the Royal Guard. When playing against Royal Guard know that they are quite powerful in melee and won’t melt to lightsabers like you might be used to. So you should do your best not to get near to them unless necessary. Depending on the scenario and what unit they are defending also know that they can come to you quite quickly so you may have very little time to respond to them. When possible it is best to attack them at range with weapons that have Pierce - as their immunity to Pierce only works in melee. It can also be a good idea to focus attacking their ward instead of the unit directly if they are in cover, as the Guardian keyword gets around their cover - and if they opt to take the wounds on their key unit instead of on the guards then that can be a benefit to you. Another strategy is to use units that have suffered large casualties such as a single trooper unit leader to tie them up in melee before they can get to their intended target. If you can tie them up for a turn you are forcing them to waste one of their powerful melee attacks on a somewhat insignificant unit or disengage - either way your attrition value / activation economy has gone way up and gives you a strong edge in the game.